In the black-rock badlands of northwestern New Mexico, archaeologists have documented a 900-year-old village with unique ties to the Ancestral Puebloan citadel of Chaco Canyon. Consisting of more than a hundred separate sites, including a two-story great house with as many as 85 rooms, the newly recorded community shows a strong influence of Chacoan culture, but at the same time, it appears to have other qualities not found anywhere else. Some of its stonework has been fashioned from local black volcanic rock, for example, and an intricate system of trails has been worn into the otherwise trackless expanses of lava around it — their exact purpose still unclear. Taken together, these clues suggest that the settlement — dubbed Las Ventanas — was a one-of-a-kind community in the Chacoan realm: a “hybrid” that hewed closely to the tradition of Chaco Canyon in some ways, but also borrowed and invented other customs to create a system that was unique to this remote town among the lava beds. “Our work has shown the amazing resourcefulness and creativity that the Pueblo inhabitants of the Las Ventanas community brought to their everyday lives,” said Paul Reed, archaeologist who led the research conducted by the nonprofit Archaeology Southwest. “These folks built a Chaco-style great house on the southern margin of the Chacoan World in the period from AD 1075-1125,” he said. “They connected to Chaco through economic, ritual, and social interaction. 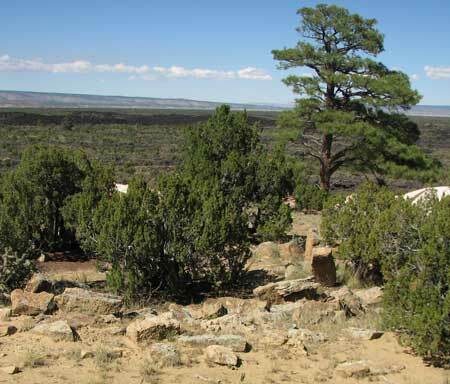 Reed and his colleagues conducted the research at the request of El Malpais National Monument, which now contains the ancient sites. “We set out to survey a large block of land, to discover, record, and map cultural sources in the lava flow,” Reed said. 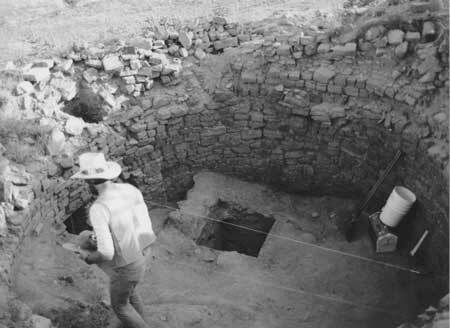 In all, the team covered more than 4,000 acres of desert, and identified about 120 separate sites, ranging from the faint remains of small houses to an impressive two-story great house that included an unusual elevated kiva, fashioned somewhat like a tower. But the ruins found at Las Ventanas are distinctly different from those found at Chaco itself, Reed said. “The ancient Pueblo community at Las Ventanas was an interesting hybrid,” he said. “I think the builders of the site clearly had links to Chaco Canyon. The great house, for example, was constructed in a distinctive style of a solid core covered by a decorate stone veneer that was a hallmark of Chacoan architecture. For one thing, some of the structures were made not with sandstone, as Chaco’s monuments had been, but with black volcanic rock. Reed speculates that this means the structures were not built by migrants from Chaco Canyon, but by locals who wanted to emulate Chaco’s style. “I think Las Ventanas was built by local Pueblo people from the area, who had trade ties and ceremonial contact with people from Chaco itself,” he said. And the cultural powerhouse to the north was by no means the only influence on the residents of this lava-rock settlement, Reed added. “The people of Las Ventanas had close ties to other Pueblo groups to the south, as well as north to Chaco,” he said. But perhaps the most intriguing feature that the archaeologists discovered was an intricate network of trails leading away from the open desert and into the black expanses of the lava field. “What surprised us the most was the vast network of trails that crisscross the lava flow,” Reed said. Together, the trails amount to more than 100 kilometers, or 62 miles, in length. What’s more, many of them don’t appear to lead anywhere in particular. “Perhaps the most surprising finding was that many of the trails went into the lava with no other likely destination,” he said. Instead, they seem to simply taper off and disappear, in a manner reminiscent of the incomplete roads that have been found to radiate from Chaco Canyon. “What this means is the trails were built, primarily, as ritual features themselves, to access different points in the lava – some close to the great house site or other sites and some very deep within the lava,” Reed said. And along many of the paths, researchers found small caches of goods, ranging from ceramics to stone tools. These further suggest that the trails may have held a ceremonial purpose, Reed said. 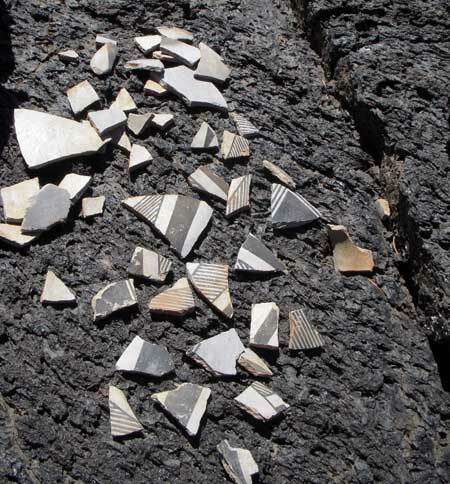 “We have interpreted many of these artifacts as ritual offerings that were intentionally placed along the trails, some in conjunction with collapsed lava tubes,” he noted. “Although we cannot say for sure, I think the lava flow itself had great spiritual significance for the ancient Pueblo inhabitants. The archaeologists have months of analysis ahead of them, as they sift through all of their new data. 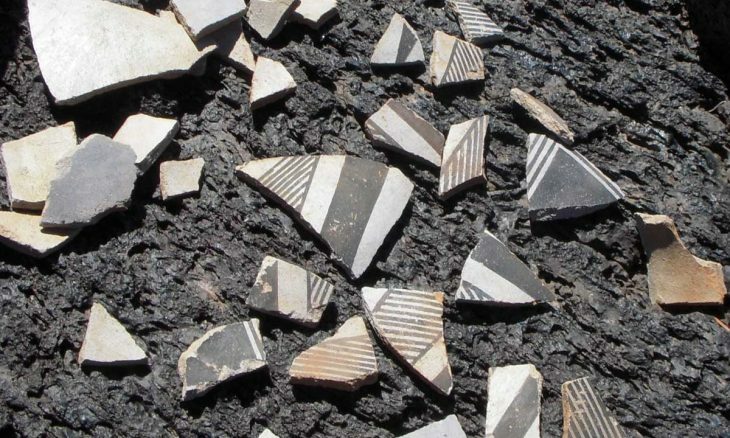 But their investigation of Las Ventanas is already offering unusually lucid evidence of just how diverse and sophisticated the communities were that fell under the aegis of Chaco culture. “In short, the Las Ventanas Community shows us the complexity inherent in the Chacoan World,” he said. “It was not a monolithic society with all sites and communities looking the same across the 50,000 square-mile area — about the size of Ireland.